NOTE TO READERS: IF THIS NEWSLETTER SEEMS INCOMPLETE, CLICK AT THE TOP RIGHT SIDE OF THE PAGE WHERE YOU ARE DIRECTED TO VIEW THIS EMAIL IN YOUR BROWSER. YOU SHOULD BE ABLE TO SEE IT THEN. OK, folks, we know you or a friend of yours is out there who can be our web guru! The website coordinator for T. Gilbert Pearson Audubon Society involves putting articles and images on it, keeping it fresh and up to date for the world to see. You or your friend needs to know WordPress, which is really simple. If we do not come up with someone, our web page will resemble a cobweb and not a vibrant web page. If you or a friend has such abilities and a few hours to spare each month, please send an email to PearsonAudubon@gmail.com. Get ready for a hayride and behind-the-scenes tour of Bowman Dairy in southeastern Guilford County! 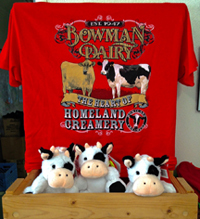 We’ll also sample some of Homeland Creamery’s wonderful ice cream that’s made on the spot. Because TGPAS needs to know how many people to accommodate, RESERVATIONS ARE REQUESTED. The tour includes a 20-30 minute tractor-pulled hayride to view the working dairy farm; hand milking the simulated cow, Miss Betty; and viewing the milking parlor. We won’t ignore the birds, of course. The dairy pastures are home to Eastern Meadowlarks, Eastern Bluebirds, and several species of sparrows. Homeland Creamery is located at 6506 Bowman Dairy Road in Julian. Those who would like to carpool or caravan from Greensboro should meet at 9 a.m. in Friendly Shopping Center in front of the Whole Foods Market in the parking lot under the sign closest to Friendly Avenue. We plan to arrive at the dairy by 9:45. Bring cash for the tour fee of about $8 per person, which includes children 2 years and older. Remember that this is the end of October, so be sure to wear warm clothes appropriate for the season. Bring binoculars to look at grassland birds. The event will be canceled if the forecast is for rain or icy conditions all morning. This will be a fun outing both for adults and kids/grandkids. Please let us know by THURSDAY EVENING, OCT. 26 that you will participate and how many people you expect in your group. To reserve your spot, contact Dennis Burnette, deburnette@triad.rr.com. When: Sunday, Oct. 8, 2 p.m.
Where: Healing Garden at the Moses Cone Cancer Center adjacent to Wesley Long Hospital, 2400 W. Friendly Ave.
Carpooling: Meet at the Whole Foods parking lot under the Sears Plaza sign along Friendly Avenue at 1:45 for a 2 p.m. departure for the five-minute drive over to Wesley Long. Many of us have visited friends or family in Wesley Long Hospital. As we walk from the parking lot to the entrance, we pass a beautiful natural area down below the walkway. This is the Healing Garden at the Moses Cone Cancer Center, an acre or so of native plants, trees, and shrubs that offers a respite for patients and their families while they are there. The garden beckons all, and so we decided to hold our Oct. 8 Second Sunday Nature Walk there. The site is laced with serene paths, some paved, some just gravel, meandering through a small wetland and rivulet in the center. Benches and garden sculpture add to the welcoming atmosphere. The back of the garden abuts North Buffalo Creek, the same stream that flows through the Greensboro Arboretum. Here the stream is slow moving and peaceful, offering a view across to the Greenway and a walking/biking trail that runs from Friendly Avenue all the way to the Audubon Natural Area, through Lake Daniel and Latham parks. If we have time we may make our way over to that side of Buffalo Creek for a short stroll along the greenway. As always we'll meet at the Whole Foods parking lot under the Sears Plaza sign along Friendly Avenue at 1:45 for a 2 p.m. departure for the five-minute drive over to Wesley Long Hospital. On Sunday afternoon, Sept. 10, TGPAS members met at the Bird & Butterfly Meadow in Price Park in Greensboro for our monthly Second Sunday Nature Walk. Dennis Burnette led the walk this time. We took an easy stroll along the mowed path through the B&B meadow, watching and listening for birds and looking at the beautiful wildflowers. Both birds and butterflies were a bit scarce. Early arrivals saw a Red-shouldered Hawk soaring over, and such common species as Blue Jays and Eastern Mockingbirds kept us company. It was likely that there were few butterflies because the many days of dry weather before the walk probably dried up the nectar that attracts them. We did see a few, including Eastern Tailed-Blue and Pearl Crescent. The best show was put on by the wildflowers. Beautiful red Cardinal Flower made a nice counterpoint to the bright yellow Tick-seed Sunflowers (a tall member of the aster family, the name refers to the way the seeds stick to clothing) and several species of goldenrod. We also found the seedpods of Common Milkweed, the primary host plant for Monarch butterflies, although no Monarchs made an appearance. Fires in the West, rising sea levels, Category 5 hurricanes, earthquakes – it seems that the news has been full of these events in the past few months. Climate change is also in the news, as we wonder how much climate change contributes to these threats to our communities. As Audubon members, we’re interested in birds and in bird protection. Our October speaker, Kim Brand, Audubon NC Field Organizer, will share the impact of climate change on birds – who, like people after a hurricane roars past, need a safe place to live – and ways you can help, from counting birds to gardening with native plants to advocating for a transition to clean energy, so we can secure a healthy future for birds and people alike. As part of the Bird-Friendly Communities program of Audubon North Carolina, Kim Brand engages citizens across North Carolina to take actions that help birds thrive where we all live, in cities and towns. Before taking a position with Audubon North Carolina, she earned its Volunteer of the Year Award in 2013. Kim studied zoology, public relations, and biology at the University of South Florida. Please join us for Kim’s presentation on a very important topic. Enjoy talks and learn about birds and butterflies on Audubon Day at New Garden Landscaping and Nursery Gazebo from 10 a.m. to 3 p.m. Saturday, Oct. 14. In addition to a birdseed sale, the proceeds of which will be used by TGPAS for environmental education, visitors can participate in a full day of activities sponsored jointly by TGPAS and New Garden. Butterfly Gardening, Dennis Burnette, 9:30 a.m. 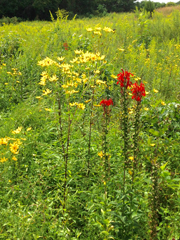 Using native plants to attract birds and butterflies, Jeremy Warren of New Garden, 10:30 a.m. 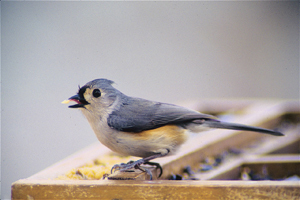 Frequently asked questions about bird feeding, Lynn Moseley, 1:30 p.m.
Naturalists 5 years and older can paint birdhouses at 11:30 a.m. Preregistration will be required along with a $10 fee. An adult must accompany each child. And birdseed will be for sale – don't forget that! You can order ahead and pick it up the day of the sale, if you place your order by Oct. 2. Click here to download an order form. But don't worry if you or your friends cannot order ahead, you still can buy seed the day of the sale. Checks or cash are preferred, and Paypal also will be available. Mark your calendar for Oct. 14 and enjoy a day just for you and your feathered friends. 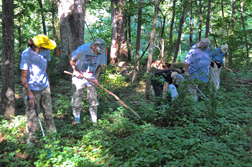 We had an extraordinary response for our Big Sweep Waterway Cleanup and box turtle roundup on Saturday, Sept. 16, at the Audubon Natural Area in Greensboro. 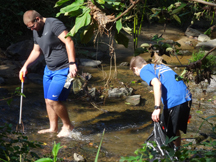 T wenty-two volunteers in teams of two, including eight from TGPAS, scoured the creek (lower right photo), woods, and trails for two hours and were able to deposit a respectable pile of debris into member Jack Jezorek's truck. The ANA is a newly designated site for the Box Turtle Connection, a 100-year research project initiated nine years ago and led by Ann Somers of UNCG. This growing study includes more than 30 sites across North Carolina. Alas, no turtles were found, but hope springs eternal. 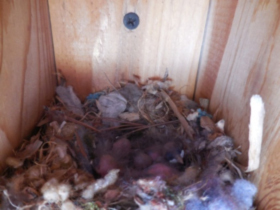 Fall is the time to clean out your bird boxes to get ready for the Brown-headed Nuthatch scouts. They will start looking for their nesting boxes during the next few months. Around our house, the nuthatches visit the feeders more regularly. Keep an eye out for them and listen for that great “squeaky” greeting. Several interesting comments came in from our members about their boxes for the 2017 nesting season. From Jack Jezorek: “I tapped on all the boxes before opening, including the one with the six eggs. No one home? Wrong! I was standing on the side of the box, but my 11-year-old granddaughter was right in front. 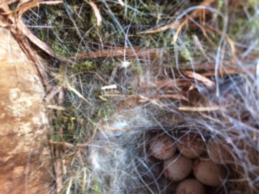 She jumped about four feet when the occupant zoomed out and proceeded to fuss at us.” (Photo at left of Carolina Chickadee nest with six eggs by Jack Jezorek). Each season a report is sent to Curtis Smalling for the Audubon NC Brown-headed Nuthatch Project. Our box holders reported on 47 of their boxes. Three boxes were Brown-headed Nuthatches, 24 were Carolina Chickadees, one House Wren, and 19 boxes had no nests. More than 250 boxes are now being monitored by our TGPAS project. Please report more information for the 2018 season. Swift’s Night Out,Parts 1 and 2 were big successes again this year. The number of swifts each night was smaller than the event held in September 2016 but still impressive events. On Sept. 6t the weather was rainy most of the day. Seventeen members of T. Gilbert Pearson Audubon Society and the Piedmont Bird Club braved the less-than-perfect conditions to gather on the rooftop deck at M’Coul’s Public House in downtown Greensboro to watch for the swifts. Hundreds of Chimney Swifts swirled about near the Carolina Theater, but when dusk came, very few used that chimney for their roosting site. Two hawks were nearby, one on the chimney and another on the roof. Swifts left to go to another place that was not determined. What a puzzling outcome! Was it caused by the weather or the birds of prey? All in all, the onlookers found this very interesting. On Sept. 21 the weather was ideal. Twenty-four members of TGPAS and PBC gathered to watch a second time. Thousands of swifts came and circled above the theater, but they played a trick on us. This time they roosted at another site nearby at 330 S. Greene St. Interesting to wonder why the popular Carolina Theater chimney was not their favorite spot this time. Again, it turned out to be a most entertaining event. Swifts Night Out was sponsored jointly by TGPAS and the Piedmont Bird Club. Many thanks go out to Matt Wangerin, field trip chair for PBC, and Dennis Burnette, field trip coordinator for TGPAS, for advertising these fun events. TGPAS members interested in helping another nature group, the Triad Chapter of NC Native Plant Society, can join them to weed and collect seed at 9 a.m. Friday, Oct. 13, at Woven Works park (Innovation Cornerstone), located at the corner of East Lindsay Street and North Murrow Boulevard. This work prepares the way for a workday in November, when volunteers from a local university will come in and place mulch. For more information, contact Judy West of the Native Plant Society at westjl@gmail.com.